This is the first one we have ever found that is naturally sectioned. Heavy specimen, different from the traditional manganese nodules. This specimen with very unique features came from the Pacific Ocean floor. 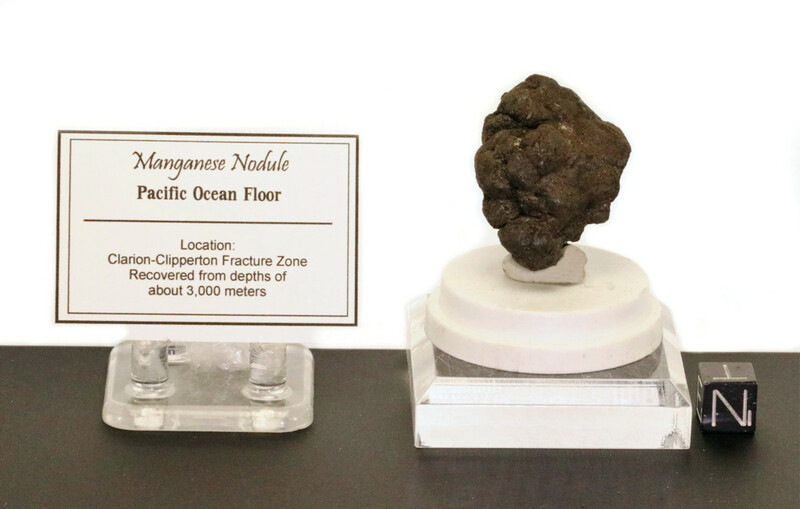 Manganese nodules are the most widespread undersea mineral resource, composed mainly of manganese minerals and are found in lumps of up to about 10 centimeters in diameter. Rare metals and important elements have been found in manganese nodules discovered on various ocean floor systems throughout the world. The following elements have been demonstrated to be present: manganese, iron, silicon, aluminum, nickel, copper, cobalt, oxygen, hydrogen, barium, potassium, titanium, sodium and traces of a few others. The estimated age of these nodules is approximately 2.5 million years old. Many of the nodules that we have for sale have folds and mammilated (knobby) surfaces that are irregular to smooth in shape and size. Our manganese nodules were obtained in a scientific materials trade with a university, in 1993. They were originally "mined" by a scientific research expedition vessel to the Pacific Ocean, in 1979, in conjunction with a major university. This polymetallic nodule ships in a display case with a Certificate of Authenticity, tag, and information about the specimen. NOTE: Stands included. Cube is not included. A professional XRF elemental assay metallurgical laboratory printout analysis is included with this order. Here is an opportunity to improve your scientific collection with one of the greatest geological wonders from the ocean floor.